MSDS stands for Material Safety Data Sheet. It can also be referred to as the PSDS, SDS or WHMIS. This system is in place to inform the user on any risks that are linked to the materials and/or ingredients that are being used. Some product contain certain chemicals that means it needs to be used carefully. In order to make the user aware of these warnings, the SDS was created. This extensive form of regulations create a framework which the manufacturer needs to adhere to in order to provide the needed information to maintain a safe working environment. In very simple words; if a product is harmful for your skin, you want to be warned. The MSDS, PSDS or other form of SDS provides you with the necessary information. Note that not every product has to have a MSDS. Some products don’t contain any ingredients to require a MSDS. If there is an MSDS the manufacturer must be able to provide you with the document free of charge. The MSDS can be a document accompanying the product (like a label, or datasheet) and/or can be provided by the manufacturer on demand. In Canada, the program known as the Workplace Hazardous Materials Information System (WHMIS) establishes the requirements for SDS’s in workplaces and is administered federally by Health Canada under the Hazardous Products Act, Part II, and the Controlled Products Regulations. The SDS follows a 16 section format which is internationally agreed and for substances especially, the SDS should be followed with an Annex which contains the exposure scenarios of this particular substance. The SDS must be supplied in an official language of the Member State(s) where the substance or mixture is placed on the market, unless the Member State(s) concerned provide(s) otherwise (Article 31(5) of REACH). With the exception of heading 16, all document headings must be populated. If information is not available, then the reason for non-availability shall be stated. The 16 headings of a SDS may include subheadings. However, the subheadings shall not be numbered. The text of the headings, numbering and sequence must not be altered. Every page of an SDS shall include the name of the chemical product as used on the label, and shall be dated and numbered. Where a specific serial number and revision date (version number) are written on the first page of an SDS, only the serial number and page may be entered on every page. Texts in an SDS should be written in a clear and concise manner. Commonly used phrases are recommended. A SDS should be in a language acceptable to the recipient. Of significance is the “Transport information” under which, if the substance is listed in the Dangerous Goods List, the UN number will be found along with other information such as the classification, emergency response guide number, packing group and subsidiary risk, if any. The 16 headings required under SANS 11014:2010 are listed below. The identification of the product (chemical name, supplier code, description, class, synonym and / or formulation) as used on the label. The nam e of the chemical product shall be the systematic chemical name or trivial; common or generic chemical name, as used on the label. If the systematic chemical name is long, it may be abbreviated, with an explanation of the abbreviation used. The name, address, telephone number, emergency telephone number, and optional fax number or e-mail address. The recommended uses and restrictions on uses of the chemical product. The date the SDS was prepared or date of last revision or review. This section summarises important hazards and adverse effects of the chemical product on human health and the environment, as well as physical and chemical hazards such as chemical product-specific hazards, where appropriate. Emergency response data and emergency symptoms should be highlighted. Detailed symptoms should be stated for Inhalation, skin, eye and ingestion. Other hazards which is not classified under GHS such as dust explosion. Any adaptation of the GHS classification for a specific country or reason should be clearly stated. This section states whether a chemical product is a substance or a mixture. If it is a substance, the following details should be specified: the systematic chemical name, common name, synonym(s), Chemical Abstracts Service (CAS) number, other unique identifiers, impurities and stabilizing additives etc. For mixtures, it is not necessary to give the full composition. However, If the level of a hazardous ingredient (as classified by GHS) is above the cut off limits, these limits, as well as concentration and concentration limits should be stated. This section describes first-aid measures to be taken in the event of accidental exposure to the chemical or mixture. It should state which actions have to be avoided at all costs as well as step by step first aid measures for inhalation, skin contact, eye contact and ingestion. Description of first aid measures such as “remove from further exposure”, to “seek emergency medical advice. Most important symptoms / effects, both acute and delayed such as nausea. A detailed description of symptoms and effects should be given under section 11. Indication of any immediate medical attention and special treatment. Additionally, advice for the protection of first aiders and/or special notes to attending physicians may be included here. This section details which extinguishing medium (water, powder or foam) should be used in the case of a fire as well as how a particular medium is either unsuitable or when it should be avoided. Depending on the chemical content of the hazardous substances, it is critical that the correct substance is used to avoid undesired behaviors and risks related to extinguishing fires. Various fire extinguishing equipment exists to handle various fire classes. As prescribed in the SABS regulation of SANS 11014, the nature of the hazardous products should also be indicated in this section as well as the specific hazards that can potentially arise from the chemical product should also be indicated. Specific extinguishing methods and protective equipment that the firefighters should use should be listed in this section as well. Methods and materials for containment and procedures for cleaning up and recovering from the spillage (only if it is different to section 11). Disposal of the retrieved substances should be documented as well. Prevention measures for secondary disasters should also be detailed in this section. The handling and storage section details how the items in the package should be handled and stored, including any equipment that may be required. There are two sub-sections that deal with each element separately. This section will detail all the required precautions that should be implemented to safely handle the chemical product e.g. “do not load with forklift”. Technical measures that indicate how to prevent exposure for the handler and the prevention of fires and explosions will also be detailed in this section to enable the parties responsible for handling to have a good understanding of how and what to do in the daily operation of the packages, in order to conduct business in a safe and responsible manner. Details of how the product should be packed and arranged to avoid contact with other items that are incompatible and could lead to a disaster if combined are also listed. Items that should be kept apart from each other could result in substantially greater risks as chemical compounds change properties once combined. It is necessary to consider all possible hazards (e.g. fire, reactivity, health) when developing safe handling procedures. This subsection will detail the recommended and preferred storage conditions for the items contained in the package (e.g. ventilation requirements). To ensure that the product is safely stored, certain criteria (temperature, humidity, in or out of direct sunlight) should be adhered to and should be explicitly mentioned. Items might require certain proximity requirements from incompatible compounds and these will be listed as well. Recommendations on appropriate personal protective equipment (PPE) (e.g. respiratory protection, hand protection, eye protection, skin and body protection). The limit of human contact or environment interaction. Where applicable, control for risk limits must be provided in alignment with section 7. The origin and allowable limits of exposure. PPE for inhaling and all body parts for prevention. The type of protective equipment and specifically designated material (e.g., type of glove material, such as PVC or nitrile rubber gloves; and breakthrough time of the glove material) shall be stated. Special precautions for specific chemicals. The section identifies physical and chemical properties associated with the chemical or mixture. As per SANS 11014:2010 this should address: appearance of the chemical (e.g. physical state, form, and colour), odour, pH(with indication of concentration), melting / freezing point, boiling point, initial boiling point and boiling range, flash point, upper/lower flammability or explosive limits, vapour pressure, vapour density, density / relative density, solubility(ies), evaporation rate, flammability (solid, gas), n-octanol/water partition coefficient, auto-ignition temperature, decomposition temperature, and / or viscosity. An indication of values must use SI system, as per ISO 1000 and ISO 80000-9. The information in this section is used to help determine the conditions under which the material may be hazardous. Hazardous decomposition products that could be produced during usage, storage, or heating other than those usually produced, such as carbon monoxide, carbon dioxide and water. Hazardous combustion products should also be included in Section 5 of the SDS. The measure of toxicity expressed in a numerical format. For instance as estimates of acute toxicity. Reflecting the physical, chemical and toxicological characteristics of the substance and their symptoms. Explanation of the various forms of exposure (e.g. single exposure, repeated exposure and continuous exposure) and different exposure routes (e.g. inhalation, skin contact, eye contact, ingestion). The effects caused by both long and short term exposure whether it be delayed or immediate in nature. Anticipated behaviour of a chemical product in environment / ecotoxicity (e.g., acute or chronic aquatic toxicity data for fish, algae, and other plants; toxicity data on birds, bees, plants). Degradability and persistence; i.e. how the chemical degrade over time (e.g. biodegradation, or though other processes such as oxidation or hydrolysis). Bioaccumulative potential, making reference to the octanol-water partition coefficient (Kow) and the bioconcentration factor (BCF), where available. The extent of mobility in soil; i.e. sate any test results of soil absorption or leaching for the chemical. Any adverse effects to the environmental, ozone layer, photochemical ozone, or global warming. This section gives guidance on proper disposal practices, recycling or reclamation of the chemical(s) or its container, and safe handling practices. Detailed information should be presented in terms of any packaging which may be contaminated. Specify safe handling procedure, methods of disposal, disposal of contaminated packaging, and / or special precautions for landfills or incineration activities. To minimize exposure, this section should also refer the reader to Section 8 of the SDS. This section describe to the user with mode of transport, how to identify and describe the goods. The modes that requires to be declare for land, sea and air. The declaration inform the user of any special requirement that they may need to be aware of. Transport hazard class(es) – to which of the nine classes does product belong to. Environmental hazards – The users need to be made aware of the risk that the product may have on the environment such as being marine pollutant and may kill fish when comes in contact. Reference can also be made to what can happen to trees. Special precautions for user- Instruction can give to special handling during transport can be stipulated with in the section. This section provides the safety, health, and environmental laws applicable to the chemical or mixture. In can be international, national or regional laws where the SDS is applied. It must focus on the local regulation aspects that may be applicable that the users need to study. Any other important safety elements that may be declared to the users if not clearly addressed in any of the above section headings will be included under section 16. Information such as training or specific restrictions that may apply to the mixture/product will be included. Any special or additional information to assist the users to control and handling the product may be stated within this section. In the U.K., the Chemicals (Hazard Information and Packaging for Supply) Regulations 2002 – known as CHIP Regulations – impose duties upon suppliers, and importers into the EU, of hazardous materials. The duty to supply information is not confined to informing only business users of products. SDSs for retail products sold by large DIY shops are usually obtainable on those companies’ web sites. The United Nations (UN) defines certain details used in SDSs such as the UN numbers used to identify some hazardous materials in a standard form while in international transit…. In the U.S., the Occupational Safety and Health Administration requires that SDSs be available to employees for potentially harmful substances handled in the workplace under the Hazard Communication regulation. The SDS is also required to be made available to local fire departments and local and state emergency planning officials under Section 311 of the Emergency Planning and Community Right-to-Know Act. The American Chemical Society defines Chemical Abstracts Service Registry Numbers (CAS numbers) which provide a unique number for each chemical and are also used internationally in SDSs. In 2012, the US adopted the 16 section Safety Data Sheet to replace Material Safety Data Sheets. This became effective on December 1, 2013. These new Safety Data Sheets comply with the Globally Harmonized System of Classification and Labeling of Chemicals (GHS). 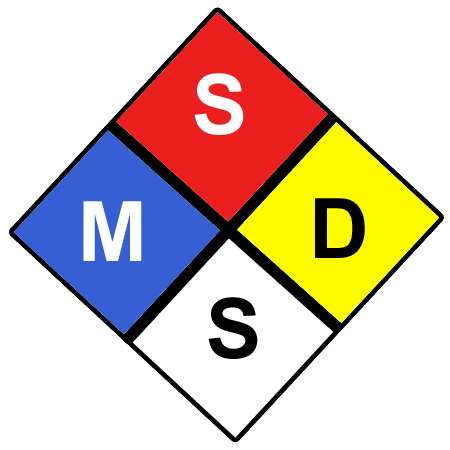 By June 1, 2015, employers are required to have their workplace labeling and hazard communication programs updated as necessary – including all MSDS’s replaced with SDS-formatted documents.